Bushfire smoke usually spells bad news for night sky photography, however this time when the local fire authority started the controlled burn, everything worked favourably and the wind started to blow in the right direction, the Moon rose and made this night really special. You can also spot Comet 252P/Linear rising in the left part of the frame. This timelapse video features two observatories located at similar latitudes in both hemispheres: Australian observatory at Mount Siding Spring and and the observatory on the island of LaPalma in the Canary Islands, Spain. I was lucky to have this video was selected as the winner in the animated sequences “aesthetic” category at David Malin Astrophotography awards 2015. The score (Morning Star) was composed by Dermot Tutty, boy soprano – Austin Hayes. Comet C/2012 X1 Linear (bottom-right) appeared to be near Helix nebula (top-left) on June 8th, 2014. This animation shows the movement of the comet over the period of two hours. I reversed the playback direction twice to make it a little more entertaining to watch. For the second time this year the Moon passed in front of Saturn for observers in Australia and New Zealand. First event in February was obscured by daylight and clouds and the weather forecast for May 14th was quite depressing too. But weather was merciful with only thin clouds passing by and two telescopes were working fine, despite a minor technical disaster a night before. A pair of binoculars provided nice views but what I saw on the back of the camera screen was even better! Mount John Observatory located on South Island of New Zealand is home to many telescopes. 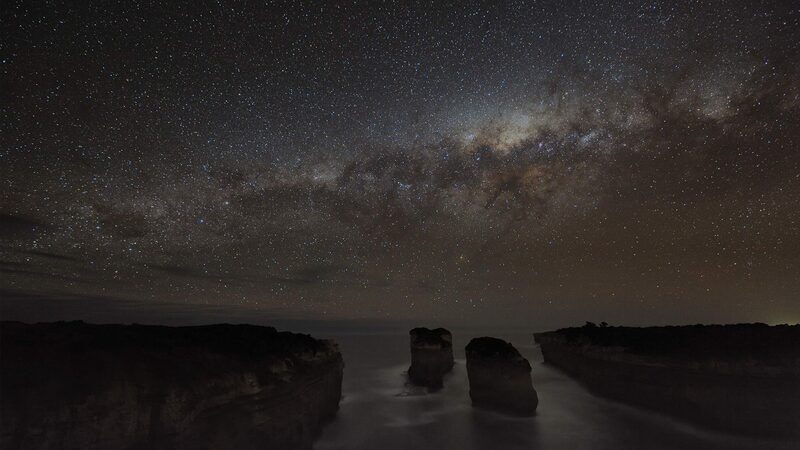 This time-lapse is a joint production by Fraser Gunn and Alex Cherney showcasing MOA (Microlensing Observations in Astrophysics) and McLellan telescopes filmed over a number of nights from 2010 until 2013. Special thanks to the University of Canterbury. Enjoy the radio telescope dishes moving in unison under the dark Australian skies! We got very lucky at Ellis Beach near Palm Cove in the tropical North Queensland (Australia) in the morning of November 14th, 2012. Half a n hour before the total solar eclipse the Sun was well hidden behind a stubborn cloud, which did not seem to move anywhere. However, just before the totality phase the cloud moved and the Sun cleared, just in time for us to witness the most thrilling astronomical event – the total solar eclipse. Thanks to Promote DSLR controllers ( promotesystems.com ) I was able to enjoy the visual show whilst three cameras clicked through the pre-programmed eclipse sequences. Many thanks to James McHugh (deepspaceplace.com) for the excellent high-resolution footage of the second and third contacts, and partial phases of the eclipse! This time-lapse demonstrates strong and changing airglow pattern photographed from Central Victoria (Australia) in May 2012. The monotonous flatness of the Western Australian outback is interrupted by the tall antennae of the Australian SKA Pathfinder Radio Telescope. The night sky is majestically dark with no man-made lights for as far as eye would see. The dishes are slowly turning following the path of stars. Sounds like stargazer’s haven… Indeed I was very happy to be there filming the CSIRO ASKAP radio telescope under the night time sky. The equipment worked flawlessly and weather was kind. A cultural reconstruction of the night sky totems and stories from Boorong clan, which lived in North-Western Victoria, Australia. By John Morieson and Alex Cherney for SEAC 2011 Conference. For the fifth year Astronomical Society of Albury Woodonga organised a spectacular star party – Border Stargaze. This year’s stargaze was exceptional in many ways including clear weather for the whole week. Everyone was busy observing the sky with telescopes small and large at night and I had two cameras clicking away. The result is this three minute (my longest yet!) time lapse animation. There are four galaxies – The Milky Way, Large and Small Magellanic Clouds, Andromeda Galaxy and many many stars. The changing sky colour from natural Oxygen glow in the upper atmosphere is quite startling. A night at Eureka Skydeck almost 300 metres above Melbourne. A few nights under the stars in Australian outback. This time lapse was awarded an honourable mention in 2011 David Malin Astro-photography awards. Magellanic Clouds and our own Milky Way galaxy. A shape of an elephant can be seen with some imagination in the rock formation on the left. The fist half of the clip is illuminated by gas-lit torches around the farm house. Nikon D700 with 14-24mm lens on a motorised mount for panning effect. Lake Tyrrel is a salt lake in the Mallee region of Victoria, Australia. The area was once home to Boorong people and the name “Tyrrel” is the Boorong word for sky. When there is water in the lake on a cloudless still night the whole sky can be seen reflected in the water. The all-night time lapse shows setting Venus, followed by the the bright band of stars and dark nebulae of our Milky Way galaxy and then Jupiter in the morning. The ground becomes softly illuminated by the Moon light around 3 am. Visit my blog at terrastro.com for more images and animations.